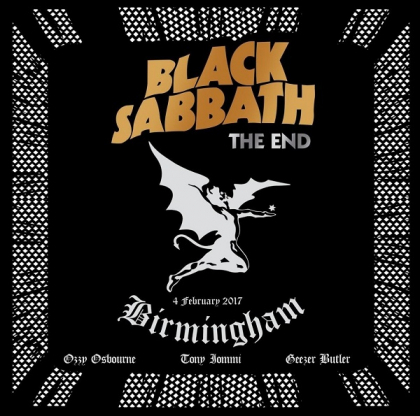 Black Sabbath gigged their way around the world for "The End" tour, playing 81 dates in all, but fittingly they closed there nearly 50 years existence as a band at the Genting Arena in their hometown of Birmingham, England, bringing their career full circle. This farewell concert is now being released now on Eagle Vision . "Black Sabbath" the very first track on their very first album had to open the concert, and it did to thunderous applause. What surprises me is that the music still stands up, the powerful and complex bass playing of Geezer butler joins forces with the very unique style of guitar maestro Tony Iommi. Ozzy’s voice back in the day was higher pitched, off course time has taken its toll on him, but he still sounds great, it is even more amazing that the charismatic Mr Osbourne is still around to pull off a tour like this. The bands energy is electrifying, by the mid-section they could be forgiven for slowing down a bit, however they seem to hit their peak with superb renditions of "Snowblind," "War Pigs," "Behind the Wall of Sleep" and "Bassically / NIB". The final section of the show allows for a bit of improvisation, as the band deftly Segway’s between "Supernaut," "Sabbath Bloody Sabbath" and "Megalomania." One of my favourite songs "Rat Salad" allows stand in drummer Tommy Clufetos' to show us his mettle, however I like many others would have wanted to see Bill Ward up there, even just for ½ the gig if his ill health issues we’re lead to believe were true. You can hardly hear Ozzy on "Iron Man" as the crowd take over with an amazing crowd participation. "Dirty Women" allows Iommi to show you he can still play a solo which can captivate people (I wish more would do this rather than just play as fast as they can, with the solo never really going anyway). Leading nicely into "Children of the Grave". The final song is just as predictable as the first, and just as rousingly received, Ozzy tells the crowd to just "go crazy" before the classic "Paranoid" fills the arena. And it certainly does tonight. “It will never be 'The End' for me. I’ll always be a part of Sabbath and Sabbath will always be a part of me,” says Butler in the accompanying booklet. So what else does The End have to offer? Well, the DVD includes raw bonus footage entitled The Angelic Sessions capturing Black Sabbath performing classic songs not played on tour. Following the band’s final concert, the simple confines of a recording studio made for Sabbath’s final studio recordings with performances of “The Wizard,” “Wicked World,” “Sweet Leaf,” “Tomorrow’s Dream,” and “Changes.” All powerful performances fitting to close such a great collection. This release may be called The End, but this band will live on in history. The End will also be available as a Blu-ray/CD, Double CD/Triple Vinyl with a limited deluxe collector’s edition containing a DVD and Blu-ray, double CD, The Angelic Sessions on CD in gatefold card sleeves, a 32-page book, Winged Demon pin, a replica The End tour laminate, and 3 plectrums.